Between 1995 and 2006, manned submersible fish surveys were conducted on the sea floor throughout the Southern California Bight. A total of 401 dives (comprising 1,015 transects and 14,373 habitat patches) were made in waters between 19 and 365 m deep. All natural habitat types were included, although both soft sea floors and rocky reefs were surveyed more than any other type. A total of 717,526 fishes, representing a minimum of 137 species and 47 families, were observed. Rockfishes (genus Sebastes), with a minimum of 50 species and 647,495 individuals (90.2% of all fishes observed), dominated most of the habitats. The most abundant species, squarespot (Sebastes hopkinsi), halfbanded (Sebastes semicinctus), shortbelly (Sebastes jordani), and pygmy rockfishes (Sebastes wilsoni), are dwarf taxa that either school or aggregate. The most abundant non-rockfish species was the benthic and territorial blackeye goby (Rhinogobiops nicholsii). Both species richness and overall fish densities were highest in the shallowest sites. Most of the fishes in all habitats were small (≤20 cm TL long) and economically important species were generally uncommon. Forty-four species were found to be characteristic of the study area (occurring in at least 5% of the transects) and these species formed three faunal associations centered around depths of 62, 105, and 168 m. Based on size frequency distributions, at least 18 of the characteristic species exhibited ontogenetic movements, with young-of-the-year and older juveniles living in relatively shallow waters and larger individuals generally in deeper depths. In this study, the abundance of juvenile widow rockfish (Sebastes entomelas), and the virtual absence of adults, in southern California waters may demonstrate an ontogenetic northward movement of this species. 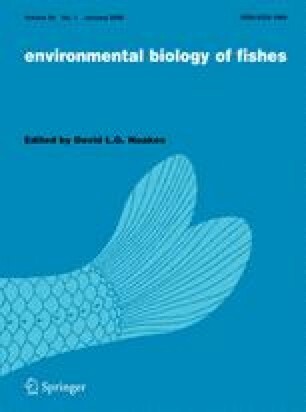 This research implies that substantial harvesting of larger species by commercial and recreational fishers has helped alter some fish assemblages, allowing small and “weedy” species to thrive. The online version of this article (doi: 10.1007/s10641-008-9389-8) contains supplementary material, which is available to authorized users. We thank the pilots of the research submersible Delta, C. Ijames, D. Slater, and J. Lilly, for support in the field. B. Lenarz assisted with statistical analyses. M. Nishimoto, L. Snook, T. Laidig, T. Anderson, R. Starr, M. McCrea, A. Bull, and B. Lea assisted with the survey work. Funding was provided by the U. S. Geological Survey’s Biological Resources Division, David and Lucile Packard Foundation, Minerals Management Service, NOAA Fisheries, SWFSC Fisheries Ecology Division, Office of Habitat Conservation, and Office of Protected Resources; the National Undersea Research Program; NOAA Marine Protected Area Science Center; and the California Artificial Reef Enhancement Program.